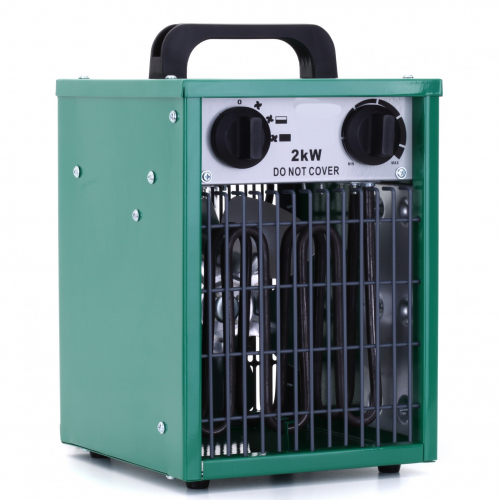 This newly developed fan heater is ideal for use in your greenhouse or other outbuilding / shed / garage. The strong metal casing is powdercoated in an attractive green colour, and will outperform the plastic cases of rival heaters. Inside is a stainless steel heating element and good quality fan which circulates approximately 186m3 per hour ensuring that the temperature in your greenhouse is kept relatively even all over the greenhouse by the good movement of air. In order to be safe for greenhouse use, new regulations state that greenhouse heaters should be IPX4 rated or above, meaning that if they encounter some wet conditions or splashing they should be safe. This model is IPX4 rated. You can use this heater as a fan only (in summer) or you can set the switch to 1kW heat or 2kW heat depending on how big your greenhouse is. There is also a thermostat included which can be adjusted and the heater will click off when the desired setting is reached. We recommend that you use the heater in conjunction with a max min thermometer in your greenhouse, to help you fine- tune your set-up. We are often asked what size greenhouse this heater will heat and there is no definite answer for that, as it depends on how cold it is outside and how warm you want it in the greenhouse. As a general guide, a 2kW will heat up to an 8x12 greenhouse, possibly a little bigger if you only want it frost free. If you are pushing the borderline with this, then take extra measures during a very cold snap (e.g -10 at night) such as adding more heat or turning the thermostat up to allow a bigger buffer during the coldest part of the night.